Among Joy's many accomplishments and contributions to Jewish education - in Israel, North America, and Eastern Europe - she served as a faculty member and mentor at ATID in our early years. Her friendship, wisdom, and "joy" will be sorely missed by her friends, colleagues, and students throughout the world. a graduate of our ATID Fellows program. Joy (Rochwarger) Balsam z"l, who died on May 21, 2004, in New York at the age of 37, proved the Talmudic dictum: shma garem, that one's name has an effect on her nature (Berakhot 7b). Her parents were surely blessed with foresight in selecting the name Joy, and she epitomized it, both in the happiness countless people experienced in friendships with her, but more so in the sense of Joie de vie: full, spirited, vigorous engagement with and love of life - both temporal and spiritual. Joy had many accomplishments, personal and professional. She grew up in Queens, NY, received her BA from Barnard, and wrote her MA thesis at Touro College on the exegetical nature of the Tosafist Torah commentary Pa'aneah Raza. She had begun her teaching at the Shevach High School in Queens, but following her aliyah, and for most of her tragically short career, she was the Assistant to the Dean at Midreshet Moriah, a Jerusalem seminary for Diaspora students who spend a year or two studying in Israel after high school. It was there, as a teacher and coordinator of the Beit Midrash that she found her niche as a mentor to the many hundreds of young women that passed through the school over the years, and with whom she maintained close contact. During her time as a Jerusalem Fellow she established Atara (Alternatives for Torah Renaissance Abroad), to serve as a framework for what was by then her longstanding commitment to and involvement with Polish Jewry. She would travel regularly to Poland to teach and organize Shabbatonim and study seminars, for some years going for a few days each month, and arranging for some of the leading rabbis, teachers and scholars from Israel and America to serve there as scholars-in-residence. From her hospital bed, days before succumbing to the cancer, she was still organizing and giving instructions for the next teacher scheduled to make the trip. On one occasion when I had the privilege to teach a group of Joy's students who had been brought to Israel for a more intense summer seminar, it was obvious to me that Joy was, for these Jews, the virtually exclusive lifeline to all things Jewish. This, to my mind, is one of the unique things about her contribution to Jewish education: She was able to see things from a different, often global perspective. With the opening of Eastern Europe to Torah learning and Jewish experiences in the 1990s, most American educators approached the opportunities presented from a local viewpoint: now we can bring our North American, British, Israeli, etc., students to see Krakow and Warsaw - what a positive effect it will have on them to see the "old country". Not to belittle the value of such programs, Joy saw things differently. She said to herself (and anyone else that would listen), "There are still Jews there, and we dare not give up on them." She knew someone had to teach them, and help them re-forge a new Jewish identity - the renaissance, as she called it. She jumped in, pulling along so many other talented people, with the same energy and contagious enthusiasm that she brought to everything she did. Although I seem to always remember knowing Joy (I can't remember where or when we first met), it was only during the year that we overlapped as Jerusalem Fellows (a program for senior educators) that we really became close. During the program Joy impressed everyone - especially in the give-and-take, rough-and-tumble discussions and seminars - as a person of substance. As was mentioned in her sister Michelle's eulogy (and by many others), Joy was real. Authentic. An Isha Chashuva. I developed a great admiration for her, and she became involved with us in the first, founding year of ATID. Had she not gone to New York after the Fellows, we had both hoped that she would have come to work with us in the administration of our program. Until her final illness we would still occasionally talk and email about a project she wanted to do for ATID "one day": to prepare a teacher's resource guide for using Rav Hutner's Pachad Yitzchak (one of her passions) as a source for teaching Jewish thought. Paradoxically, her substance and seriousness never alienated students or colleagues. On the contrary, it drew them nearer. Her humor, playfulness, and warmth blended perfectly with her candor and drive; her deep commitment to tradition and traditionalism was only enhanced - never compromised - by her unconventionality. On the final day of seminars when we were at the Jerusalem Fellows, we had a concluding program in which everyone was asked to bring in some object, and describe how that symbolizes what they gained from the year. Honestly, I don't remember what anyone else, including myself, brought or said, except for Joy. She had a type of child's wind-up toy, which, when released, would bound about the floor in a convulsive frenzy. She said that a friend had once bought it for her as a gift, because that's how she viewed Joy: boundless energy. Joy said that during the year at the Fellows she had begun to think that it might be time to put more focus into what she was doing, personally and professionally - stop bouncing about quite so much - although surely not to diminish the seriousness she brought to her work and life. This may have been part of the reason she chose to go on "shlichut" to New York during these last four years (there was never any doubt she'd return to Israel). She worked first at the Mandel Foundation's North American office, where she was responsible for setting up training programs for Jewish educators in JCCs. Most recently, she was a program officer at Avi Chai, where she took great pride in her work overseeing the publication of BabageNewz, the prize-winning journal for children, used in Jewish schools. With her typical professionalism and enthusiasm, she sank herself into her work, but she was candid to her friends that she was working with similar vigor at "settling down". 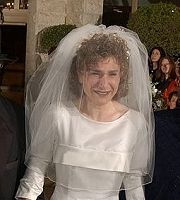 Her whirlwind romance with Jerry Balsam culminated with their March 2003 Jerusalem wedding. Those that danced at that wedding never saw a bigger smile on what was always a smiley face. Tragically, within a half-year she was diagnosed with melanoma. At first there was optimism, but the remission was fleeting, and in little over a year she had died. Her infectious joy and enthusiasm, substance and authenticity - and that smile! - won the hearts of countless students, colleagues and friends, in America, Israel and Poland, who will always treasure the memories of Joy.